I can't believe it's been almost a month since I last posted. Today, the move out of my Harrisonburg apartment finally finished! I'm settling into my new apartment- so far, so good! I made these brownie bites a while ago, for my friend Rekik's graduation party. 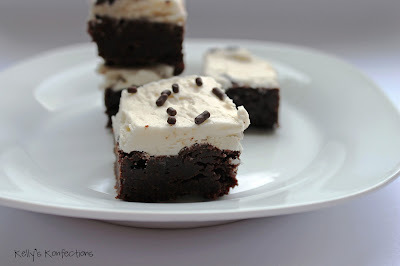 They're my favorite brownie recipe, cut into itty bitty pieces, with vanilla bean buttercream on top. Um, hi. I'm hoping that once I'm all settled and things are semi-normal, I'll be able to post more regularly, get into a groove again. This buttercream frosting is truly the best frosting in the world. I've eaten soooo much frosting in my life, and this is the most consistently delicious, perfect recipe I've ever had the pleasure of consuming. 7. Let brownies cool slightly, then stick in the fridge for ~15 minutes. 1. Cream butter in the bowl of an electric mixer (paddle attached) until light and fluffy, 3-5 minutes. 2. Add powdered sugar one cup at a time (use the splash guard that came with the mixer, you'll thank me later). 3. Add vanilla bean paste, milk and salt. Beat until very well blended. 4. Switch to the whisk attachment, and beat for 1-2 minutes. Take the brownies out of the fridge and remove them from the pan. Spread buttercream, then stick them back in the fridge for 10 minutes. Remove, then cut them into small pieces.